Turtle Candy is John's favorite. Maybe it's because he grew up in New Mexico and he misses the fresh pecans. Maybe because there is caramel. I rest my case when it comes to caramel. Then there's chocolate. My fave. Top it all off with a sprinkle of course salt and you have perfection in a single bite. The only bummer about this recipe.....pecans are very expensive in Rhode Island! In New Mexico they were dirt cheap. In Rhode Island they are not, but I made them anyway cause heck it's Christmas and what other time of year are ya gonna splurge on a nut right? Preheat oven to 250°F. Lightly salt pecans and toast on baking sheet for about 25-30 minutes. While pecans are toasting, melt caramels according to package directions. I melted them in the microwave and it was just fine and dandy. 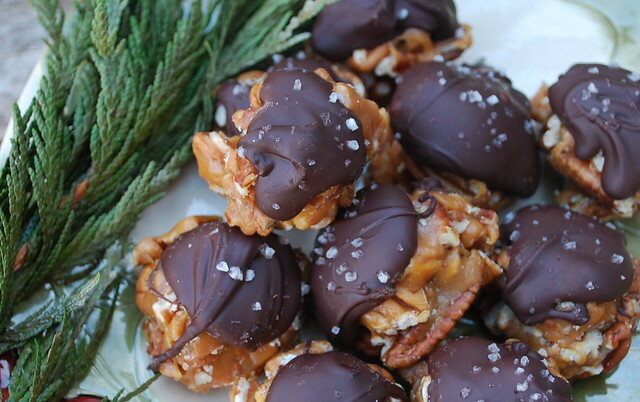 Mix toasted pecans into melted caramels. Slightly cool, so you can handle. Drop tablespoon size rounds onto buttered or lined baking sheet. If mixture begins to harden, reheat for a few seconds at a time in the microwave. Let cool. Melt chocolate chips according to package directions. Again, the microwave worked like a charm. Top each caramel/pecan drop with about 1 tablespoon of chocolate, and sprinkle with a little bit of salt. Let cool. Store in airtight container. Makes about 4 dozen. This will probably be my last post until after Christmas. Like many of you, I have lots of work to do in the kitchen over the next few days. I'm looking forward to a house full of family and good food. Christmas just makes me feel all warm and fuzzy inside and I plan on making that feeling last as long as possible. To all my faithful blog follows... I wish you a very Merry Christmas. I hope it's filled with everything you love! John, Lisa, Jesse, Evan & Moose! 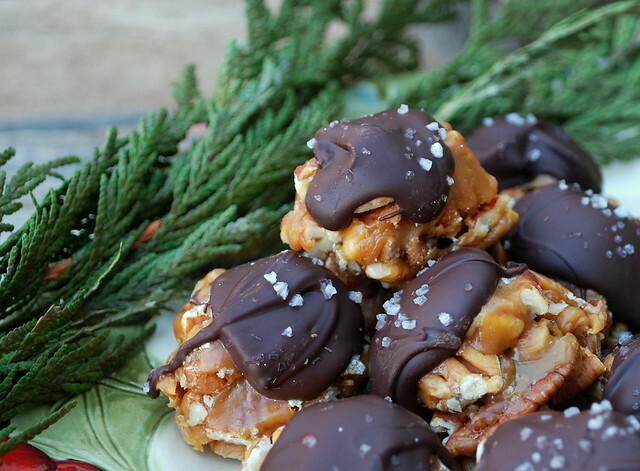 I could still eat a box of Turtles...now one can make them at home! Have a Merry Turkish Christmas! These look perfect...great combo of flavors. I wish pecans were cheaper, too...I would think being in the south they would be, but I guess I am in the wrong part of the south. These are my husbands absolute favorite candy. I love them too. Have a very Mery Christmas at your house! Lisa - do you have an e-mail subscription to your blog - my life gets crazy and I check your blog about once a month but I want to know when you have a new post--google follow - I have too many! Do you have a facebook page for your blog? Also the half roll pan -- where can I order that or get it - I am the queen of finding things on the internet but can't find it. Merry Christmas! So simple and so perfect! Happy Holidays!